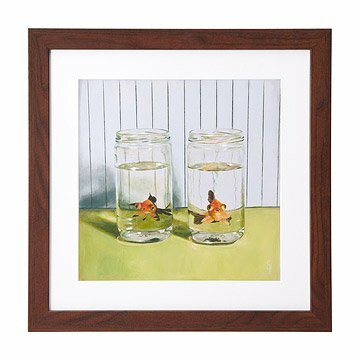 This print features an offbeat characterization of two watchful goldfish. Spring Hofeldt"s studies of the offbeat characters of the animal kingdom cast a pair of goggle-eyed goldfish as silent social critics. The pair stares out from their splendid isolation with a wry nod to the practice of "people watching." Each print is produced using acid-free paper and presented under an acid-free mat and Bonanza wood frame. Designed in Brooklyn, New York. Printed and framed in Portland, Oregon. I will probably buy this for myself! Great picture! Cute and funny. Love the title.